West Indies 3-170 (Marlon Samuels 69*, ChrisGayle 43, Ravi Bopara 2-23) beat England 9-143 (Tim Bresnan 47*, Ravi Bopara 42, Samuel Badree 3-17, Samuels 2-21) by 27 runs. 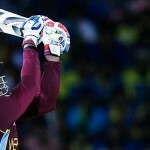 Marlon Samuels demonstrated an all round performance in the opening T20 well assisted by Chris Gayle and Samuel Badree as the Windies defeated England easily. The Caribbeans piled up 170 runs for the loss of three mere wickets in 20 overs and the Englishmen managed 143 with one wicket in hand in the required overs. 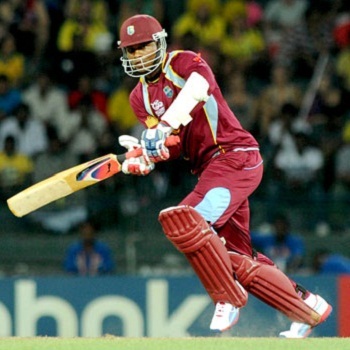 Marlon Samuels (West Indies) was declared ‘Player of the match’ for his excellent show in the game. Earlier, Darren Sammy, the skipper of the Windies, won the toss and opted to bat first on a good looking track. 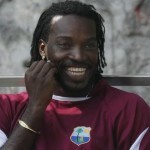 Dwayne Smith and Chris Gayle took off smartly by smashing 56 runs in six overs with 2 lofty sixes and 9 fours. The first was clean bowled by Ravi Bopara in the next over and was replaced by Marlon Samuels. Gayle continued with his brisk scoring but was declared leg before wicket off James Tredwell at 87 and Lendl Simmons was caught by Michael Lumb off Bopara for just three. Andre Russell walked in next while Samuels was dropped at 43 on the first ball of the 18th over. The latter utilised the chance by dispatching five consistent fours on the following deliveries and went past his seventh T20 fifty. Marlon Samuels and Russell secured their ends with 69 and 24 as West Indies hammered 170 with seven wickets remaining at the end of the 20th over. England started off horribly by losing two wickets for just 13 runs and Lumb was gone for 18 as the score touched 36. That was the start of the disaster for the tourists and the wickets kept on sliding at regular intervals. They were struggling at 5-55 and Ravi Bopara exhibited some resistance by scoring few runs in the middle order. He became the seventh victim for 42 and the wicket fell at 101 in 14.3 overs. Tim Bresnan played a breezy unbeaten innings of 47 off 29 with 1 six and 5 fours as England reached 9-143 after 20 overs. Samuel Badree was the star performer with three, Marlon Samuels held two whereas Sunil Narine and Dwayne Bravo shared one wicket each. West Indies clinched the first game with a margin of 27 runs and leads the series at 1-0.